The story of Blade starts at his birth where his mother gets attacked by a vampire as she was giving birth to him. Blade is a human character but has some vampire traits since he received contaminated blood as he was being born. The character Blade has appeared in different comics as well as in the movie series done by Marvel. When it came to introducing Blade to the online casino, no one would have done it better than Playtech. 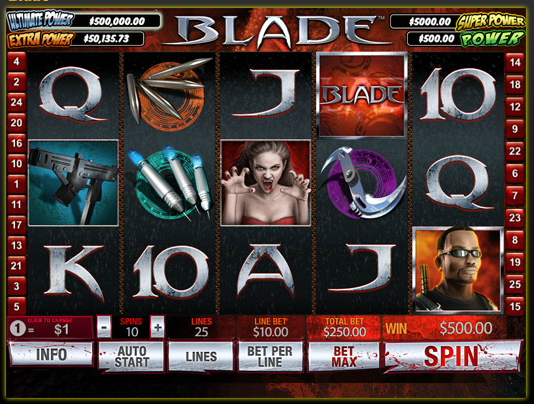 Playtech is the brains behind Blade and his adventures in your favourite online Casino. Blade is a five-reel slot with 20 pay lines available in all Playtech powered casinos. Just like players playing other Marvel slots, a Blade player has the option of wagering up to 10 coins a line and adjusts the coin size from £0.01 to anything not exceeding £5. The objective of this slot is to match similar symbols across the active pay lines with wins counting from left to right. The symbols vary from the traditional 10s up through aces to an assortment of weapons (blades and guns) and artillery. Basic Wins come from matching the traditional symbols of 10, J, K, Q and A while bigger wins come from arranging matching weapons and bullets. The fun doesn’t end there. If you hit five Vampire symbols you will receive 1, 000 coins for every coin you wagered. By now you must be wondering if Blade himself features in the game. Come on, you can’t have a slot on Blade without the man himself. And if he does appear on your game screen, you should be happy. Blade is the wild symbol! Blade can be substituted for any other symbol to form massive winning conditions. On his own, he even goes a step further. When you land five Blade symbols, you instantly win 2,500 credits – the most you can win on a line without the Blade Split feature (wait for it…). What about the scatter symbol? The blade logo is the scatter symbol, and it comes with huge winnings too. Having three or more Blade Logos on your screen will get your bet multiplied up to 666X (creepy) for three and five symbols respectively. There are three different bonus features you should be on the lookout for; a free spins game; Blade split feature and the always favorite Marvel Jackpot game. If you land three or more Blade logos, the scatter symbols, in one single spin, you get 15 free spins. The free spins are ushered by an arbitrary multiplier ranging from 2-5x your bet size and apply to all your winnings during the free spins. The random multiplier will continually change throughout the bonus round. For every winning spin, the multiplier is added by one up to a maximum of five. Likewise, the multiplier falls by one for every losing spin up to the minimum of 2x. The scatter symbol acts as an extra wild symbol during the free spins. This is the unique thematic bonus feature you will come across online. When a particular Blade Split symbol appears on the fifth reel of any spin, and you have a winning combination on the reels, expect your winnings to grow tremendously. The final symbol on any winning line will be split into two thus doubling your wins. The icing on the cake comes when you hit six of a kind! Yes, with the spilt feature you can hit six of a kind. There are special rewards for each symbol when you hit six of a kind. For example, Six wild symbols wins you 25,000 coins for each coin you wagered (five of a kind earns you 2,500). Just like any other Marvel Comic slot by Playtech, Blade gives you a chance of participating in Marvel Multi-Level Progressive jackpot. This jackpot is triggered entirely at random, but the higher you wage, the greater your chances of unlocking it.